You are currently browsing the category archive for the ‘Communication’ category. And there is an area in which procrastination is even more evil: when you deal with people so procrastination and people management (can be your direct, your son, a friend …). Procrastinate a negative feedback? You enforce a wrong behavior. Procrastinate a positive feedback? You have chances that a good behavior is changed in search of a (potentially) bad one. I’ve just got an experiment: I’ve got the names of the lists you have added @PierG (my Twitter account) to. Then I used Wordle to make a map … and here is the result. 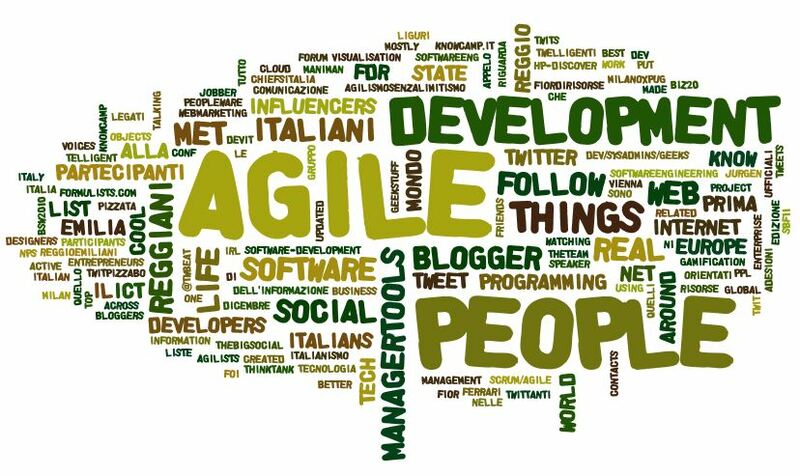 So it seems so my ‘personal brand’ as associated with people (that’s probably because you use ‘people’ in the name of the list like ‘agile people’, ‘italian people’ …), agile and development, things. There is some social too, web, ICT, europe, influencers, reggiani, reggio emilia, managertools. In my readings I’ve collected some resources about “Social Media” and I want to share them with you. I hope they can inspire or be helpful! The title of this posts is probably meaningless to you (but if you know what it is, just let me know using the comments 🙂 ) but reminds me of a good time. Yes sometimes good times come, not many usually, but they come. I think our culture is too focused on learning through mistakes, looking at problems or failures. There is a lot of hype around the fail early paradigm. I’m not against it and I think we must start getting more from our success stories and moments. So (1) celebrate! Yes Sir, when you do something good, you are successfully do celebrate. It’s not a sin. It’s good for our self, for our self estime, for our colleagues, for our family too. Smile. Be happy! (2) learn. What went well? What can you do differently? But above all what was the key success factor of this success? Our brain stick to these emotions and you don’t need to be beaten to learn. Forget it. Learn from success! (3) after a successfully project or task or … use this positive power, this power moment, to study something new. Maximize this learning moment studying something new: add a new arrow to your weapons. Last week I had the chance to listen to a good training class on innovation. The teacher talked a lot about his experience with several well known companies, talked about his best projects and then did his class. There are the micromanagers. The ones who believe they can do better than anyone in their team and for this reason they use people in their teams as their arms …. just because they don’t have time enough and so are obliged to ‘use’ other people. Then there are those who see themselves as managers who delegate. When they have something they cannot do, or don’t want to do or … they throw it to someone in their team. Almost no direction given, just thrown the activity / problem like a ball and above all no reporting / feedback model in place. When something goes wrong they start running and shouting …. and thinking ‘next time I’ll do it myself’. Then there are those who choose what to delegate to whom, who provide proper context, proper guidance, proper empowerment, who agree in the reporting / feedback model. Those who are in touch with the activities because they are reported with the proper cadence and the proper content.